Peach Melba is the name given to a dessert of peaches and raspberry sauce with ice cream, a combination invented by the French chef Auguste Escoffier in 1892 in honour of the Australian Soprano Nellie Melba. It's an Australian classic, and I simply couldn't do a peach feature without putting my twist on this delicious dessert. #1 Ensure your puff pastry is completely thawed before moulding into your tart tin. #2 Grease the base and sides of your tart tin and place a circle of parchment paper in the base. The butter under the parchment paper will hold it in place and prevent it from slipping when you press in your tart base. If you have a fluted tart tin, just stop the circle shy of the edge to ensure the parchment paper doesn’t crinkle. Then butter over your parchment paper and sift a thin but even layer of flour into it. #3 When removing the excess/overhanging puff pastry from your tart tins, cutting will stretch the pastry and result in messy edges on your tart. Instead, take the side of a knifes blade and press down firmly onto the tart tins edge. This will pinch the pastry between the knife and the tart tin and allow the edge of the tart tin to cut neatly through the pastry. #4 To ensure that your eggs are mixed through your custard evenly, whisk them lightly with a fork before adding them to the saucepan! This way, you won't end up with streaks of egg white through your custard and avoid eggy chunks in your finished product. #5 Once your custard is on the stove top, whisk it continuously and don't walk away from it once it's on the stove-top. This will allow the mixture to heat through gently and avoid the mixture boiling. Boiling the custard will cook the egg in the mixture and thicken it, which does make custard... but we don't want this mixture to resemble custard just yet, once it's finished heating through it should still be a runny liquid and will bake into custard in the oven. Grease and line the base of four small tart tins and set aside. Remove a sheet of puff pastry from the freezer and set covered on the countertop to thaw completely. Place 125g fresh raspberries in a blender or food processor and blitz until a puree forms. Combine 50ml thickened cream, 40ml full cream milk, 1 lightly whisked egg, 1tbsp white sugar and raspberry puree into a medium saucepan and place over low heat. Whisk the mixture gently until all ingredients are well incorporated and the custard has been thoroughly heated through, being careful to avoid allowing it to boil. Remove from the heat and set aside. Cut your sheet of thawed puff pastry into half and then half again to form four equal squares. Gently press one square of pastry into each tart tin,. You can leave the excess pastry hanging over the edge of the tin for an artistic look, or press the side of a knifes blade down onto the rim of the pie tin to 'pinch' off the excess pastry. Using a fork, poke two sets of holes into the base of each tart, and set the tart tins onto a baking tray. Pour your now slightly cooled custard mixture into the tarts, splitting it evenly between the four. In a small bowl, whisk one egg and 1tsp of milk to create your egg wash. Using a pastry brush, paint the exposed pastry on each tart with your egg wash and sprinkle with white granulated sugar. Move your tarts to the oven for 25 minutes or until the pastry is golden brown and the custard has set. While your tarts bake, cut two white peaches down the middle, remove the stone in the centre and cut each half in half again longways, you should be left with roughly a 1cm - 1.5cm thick round of peach with a hole where the stone sat in the centre. Roll each peach slice in white granulated sugar and take to it with a blow torch to caramelize one surface of each slice. Set aside to cool. Once ready, remove your tarts from the oven and allow them to cool, either slightly or completely. This is all down to personal preference. Note that you will be putting a scoop of ice-cream on top, so the warmer the tart the quicker that ice-cream will melt. I like mine to be warm. Place a peach slice atop the custard layer of each tart, then top that with a scoop of vanilla ice-cream and serve. Holy moly, that looks amazing. This might be the best dessert I've ever seen. Om nom nom. This looks insanely delicious! I will have to try this over the weekend! Didn't know this tart at all, looks so yummy !! That looks absolutely delicious! I'll have to give this a try in my kitchen. I'm sure that my guys will love it. Ooh, I just love raspberries. They should be in more food. I can't wait to make this for afternoon tea sometime. Oh, what a delicious looking dessert! This tart is something I definitely need to try at some point. Wow, such a perfect and delicious dessert to serve in any type of occasion, seeing this makes my mouthwatering! Oh my! That looks amazing! I can think of at least three occasions that I need to make this one for now. I just love a good tart! Wow! I can't wait to try this. Looks very delicious. This tart is just so unique. I would really love to try making this tart to almost all occasions. An interesting way of making the dessert. I love how the big chunk of peaches are used. This tart!!! Almost licked my laptop. I will make it for sure, thank you so much. These look so juicy and sweet; my family will love these! Great recipe! That looks really delectable and yummy to eat. 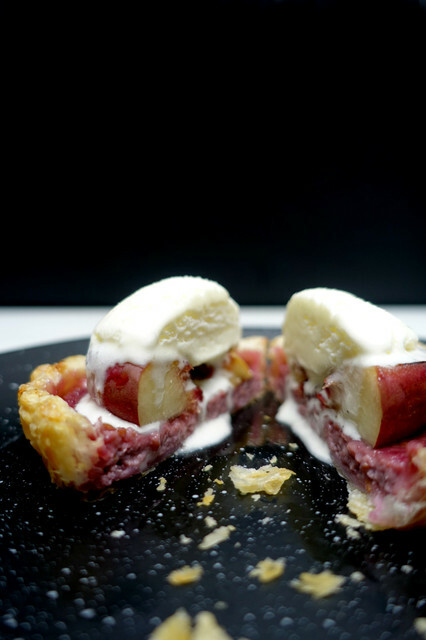 Thank you so much for sharing this Peach Melba recipe and a bonus trivia about it. Oh wow, this one is a winner. I would love to try making this. My boys would absolutely love this for sure. Incredibly beautiful!! :D Yum! I love this, Dayna.